PALO ALTO, Calif. — Secretary of State Rex Tillerson says it’s crucial for the U.S. to maintain a military presence in Syria to prevent the Islamic State group’s resurgence. In a speech at Stanford University, Tillerson signaled a deeper American commitment to the Mideast nation. He says the Trump administration won’t repeat President Barack Obama’s “mistake” in Iraq when he withdrew American troops. In Syria, Tillerson says U.S. military will remain for the foreseeable future. On Syria, President Donald Trump entered office focused on defeating terrorists. But the mission as described by Tillerson now appears bigger. Beyond defeating IS and al-Qaida, it includes several longshot propositions. Among them — securing a successful U.N. peace process, getting Syrian President Bashar Assad to leave power and ridding Syria of Iran’s influence. 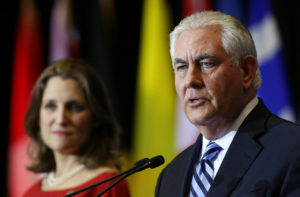 Left: U.S. Secretary of State Rex Tillerson and Canada's Foreign Minister Chrystia Freeland speak at a news conference during the Foreign Ministers Meeting on Security and Stability on the Korean Peninsula in Vancouver, British Columbia, Canada, January 16, 2018. REUTERS/Ben Nelms.